Many parents wish that their kids would spend more time outdoors and less time in front of a screen of some sort. But once kids get past that age where everything is intriguing (even if it’s just dirt), it becomes more and more difficult to keep your kids entertained outdoors. Luckily there are some awesome toys on the market that will help your kids get some much needed vitamin D while also using their imaginations and maybe even getting some exercise. Avoid the summer “I’m bored” blues by investing in some of these awesome toys! 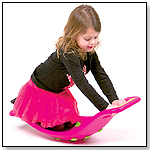 The teeter popper provides hours of fun for all ages and it helps them practice their balance and hand-eye coordination skills while improving their core strength, stability, leg strength and gross motor skills. They can sit, stand, lay, rock and roll. 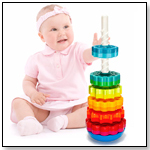 The recommended age for this toy is 3 and up but I’ve seen many parents enjoy this toy as much as their kids so at $37.00 this toy is worth the money for the longevity alone. Tents are fun for so many reasons: they are great for imaginary play, backyard campouts or sleepovers and as a respite from the intense summer sun. Choose a fun themed tent that your kids will enjoy and try to go with one that will grow with them. We love this Volkswagon Van play tent that will add a fun retro vibe to your backyard. Hammocks have long been a signature backyard or patio item for many homeowners but kids can enjoy a mini-hammock just as much as adults. Pick up a portable hammock that you can move around the yard between different trees or if you don’t live amongst hammock-worthy trees try this Hanging Crow’s Nest which is waterproof and comes with a plush cushion so you can count on your child spending many hours in this cool kid version of a hammock. Maybe you can even get them to tackle that summer reading list! If you live in a hot climate, a water toy is a must for your backyard! Many people choose to buy a small wading pool or slip ‘n slide but I love a good crazy sprinkler to keep the kids active (in hopes of an early bedtime of course!). 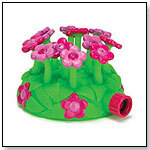 Kids will love the fun look of this Sunny Blossom sprinkler and as soon as you plug it in and turn on the water you will hear squeals of joy for hours and hours! Are you one of those parents that likes to incorporate a good science lesson into your outdoor fun? 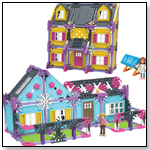 The recent popularity of solar energy makes this toy a great purchase for an eco-minded family. This solar balloon soars high into the sky entirely powered by the sun. This toy demonstrates buoyancy, convection, thermodynamics and solar power so basically its a lesson for the grown-ups as well.